Friends of the Jacobus Vanderveer House Win Award from Somerset County Cultural & Heritage Commission ~ The History Girl! 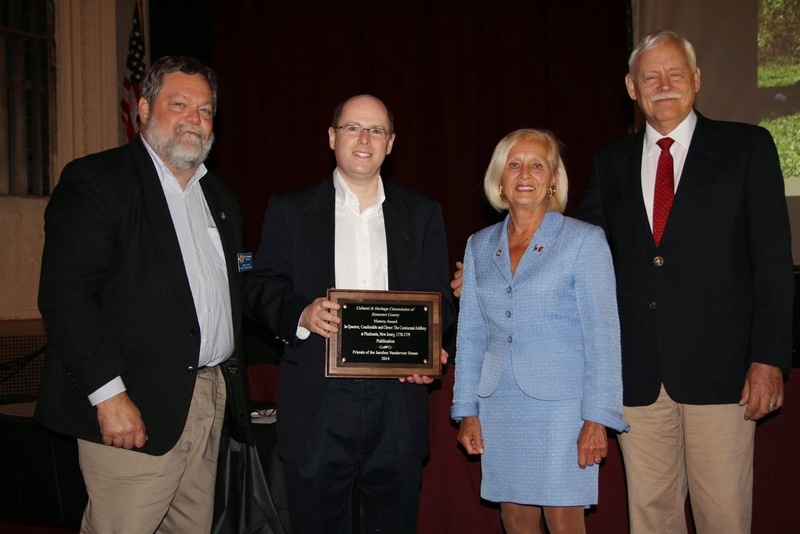 “In Quarters Comfortable and Clever,” a video depicting Pluckemin’s Revolutionary War artillery cantonment, earned a History Award from the Somerset County Cultural and Heritage Commission at the 2014 Historic Preservation and History Awards Ceremony held at the historic Brook Art Center in Bound Brook on May 21, 2014. Robert Bouwman, President of the Somerset County Cultural and Heritage Commission (SCC&HC) (far left), Patricia L. Walsh, SCC&HC Freeholder Liaison (second from right) and William Schleicher, a member of the Historic Preservation and History Awards Committee (far right), present a History Award to Sean Blinn, President of the Friends of the Jacobus Vanderveer House Board of Trustees, at the Somerset County Historic Preservation and History Awards Ceremony at the historic Brook Arts Center in Bound Brook. Image provided by SCC&HC. “We are honored to be recognized for our efforts to increase public awareness of the historic events that occurred here in Bedminster during the Revolutionary War,” commented Sean Blinn, President of the Friends of the Jacobus Vanderveer House Board of Trustees, which commissioned the video to tell the story of the nation’s first military academy and its pivotal role in the American Revolution. The Jacobus Vanderveer House served as the home and headquarters for General Henry Knox during the winter of 1778 - 1779. General Knox supervised the construction of the cantonment (now located in the Hills Development) and established a military training academy for the Continental Army. Working with Dr. John Seidel, Director for the Center for the Environment & Society at Washington College in Chestertown, Maryland and lead archaeologist on the Pluckemin Archaeological Project in the 1970’s; historical geographer Stewart Bruce; historians; and students at Washington College, the Friends of the Jacobus Vanderveer House authorized the use of sophisticated mapping software to create a 3D visualization of the lost Pluckemin cantonment in a series of digital animations that is interpreted and narrated by scholars. 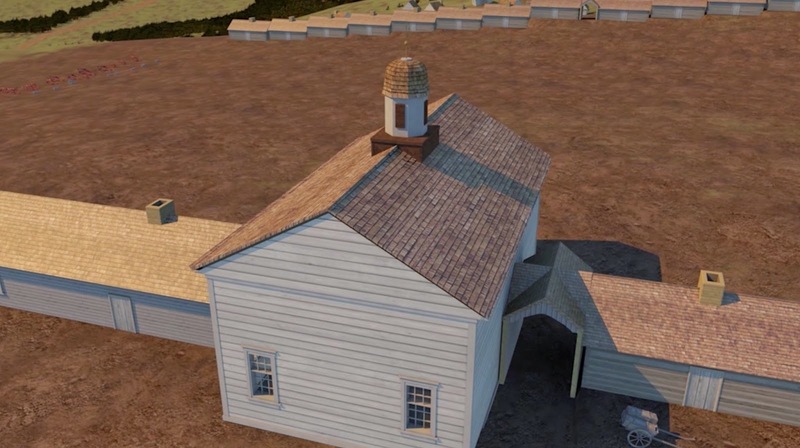 The animated visualization of the 1778 - 1779 cantonment depicts buildings (officers’ quarters, armorers’ shop, artificers’ quarters, tin smith’s shop, etc.) as well as the physical materials, tools and daily activities of life on the site. A screenshot of the Academy Building from “In Quarters Comfortable and Clever,” a video depicting Pluckemin’s Artillery Park. “In Quarters Comfortable and Clever” complements the Friends’ more traditional interpretive programs, including authentic artifacts, period rooms, The Prich Matthews History Center, museum displays, artwork, maps and printed materials at the Jacobus Vanderveer House. Funding support for the video was provided by grants from the Somerset County Cultural and Heritage Commission and the New Jersey Council for the Humanities. The project was also made possible with support from the Somerset County Board of Chosen Freeholders, and the Somerset County Open Space, Recreation, Farmland, and Historic Preservation Trust. Each year, Somerset County recognizes exemplary historic preservation and heritage efforts through its annual Somerset County Historic Preservation and History Awards program. The program is sponsored by the Board of chosen Freeholders and the Somerset County Cultural & Heritage Commission.